With the outburst of technology, POS Software systems have traveled a far longer journey then we think. Business owners are adapting and coming up with the best sales strategy every day, and the retailing business is now a close run. According to the owners need many retail POS software solution companies came up with customized solutions with their unique POS software systems. But, you have got to choose between the different technologies available in the market to make the optimum output from your store. Desktop POS : These are traditional POS systems, best used by retail stores that have cash dedicated cash wraps where cashiers ring up sales. Supermarkets, Big retail stores use it by integrating it with barcode scanners, cash drawers, credit/debit card readers etc. to make it highly functional. These are highly recommended and are trending as they help the owner/ manager to see employee status, manage inventory, conduct loyalty programs etc. Tablet POS : Quick service Restaurants, small retail stores, professional services, coffee shops, theaters etc. kind of places need a catchy, fast and minimal methods to check out the customer. Now, due to rapid development in both software (IT) and hardware industry, Tablet POS are; 1. Converted into mobile POS for some specific cases and 2. are able to do various activities based on software applications they have. Your service provider can recommend you simple applications working as a simple cash register to complex ones which handle inventory situations and employee time tracking. For vendors (Street vendors, event-specific vendors): You have got to choose Mobile Point-of-Sale systems. With it’s a fast and unique feature to process payments and applicability to a mobility of the cashier, this type of POS fits perfectly for you all. Self-service Kiosk POS : These are software solutions customized as per the needs of the agent/ retailers. These are generally used for self-serving ticket sales devices for theaters and are also used for railway tickets. These may be integrated with third-party mobile apps that can be used to authorize and authenticate the customer without human interference. Terminal POS : These are enhanced software- hardware integrations which provide you all in one facility ranging cash drawers, card readers to inventories and employee management. Most of them are generally based on cloud platforms and require continuous connection to internet. They are majorly used by full-service restaurants, grocery stores, salons, electronic stores etc. All in one POS : Well this is the true future. Everything at a single point. They are literally everything that we discussed above on one single platform. They can be sued at any retail shop software provided the features are required there. India and it’s fast growing cities are adapting to all in one POS from the past couple years rapidly. Well, I would say, you already know by now what are the features that your retail store requires. So choosing has become simple. Also, due to uprooted market of retailing solutions, your any demand can be fulfilled. The retail software and POS software has become affordable for all types of businesses. 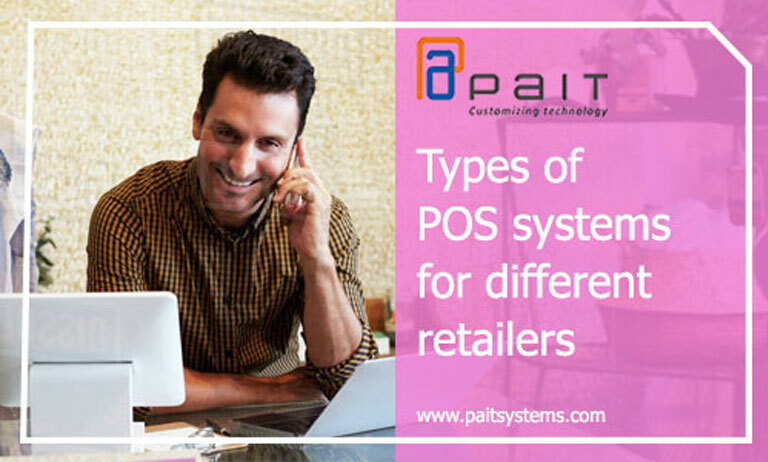 PAIT BIZ Pvt Ltd is a Retail software company in Pune providing help to local and national retail owners to choose the right POS software for their retail shops. Choosing the right thing is not about your choosing ability, but it’s about your experience and we, at PAIT BIZ are ventures of experience when it comes to retailing business software solutions. Knowing the correct questions is better than having some random solution.